The small but growing city of Bonifacio Global City is home to roughly 40,000 people. The city is dotted with plenty of places in which to satisfy and meet one’s day-to-day needs. The two ‘outer edges’ of Bonifacio Global City have the largest supermarkets in the area. Right beside the sprawling St. Luke’s Medical Complex is the large wholesale and warehouse supermarket S&R (corner 5th Ave and 32nd St). This supermarket is accessible to members-only and features some of the best imported and local food and necessities. Not to worry about the membership; signing up is quick and easy and immediately allows one to access the huge supermarket! 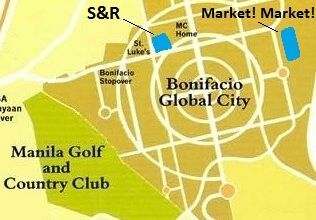 On the other side of Bonifacio Global City is Market! Market! (29th St, corner McKinley Parkway). This particular supermarket combines a shopping mall experience with an open and traditional market/bazaar model and offers plenty of local and native selections. Price-wise, Market is more affordable than S&R, while in terms of overseas-sourced products S&R has more of them. A nice addition is the deli food shop Santis (30th St, corner 6th Ave), where upscale brands, cold cuts and cheese directly imported from Italy & Europe (with Prosciutto and Mortadella being our favorites) can be found. The latest supermarket that opened in The Fort is SM Aura just next to Market! Market! There are plenty of banks and automated teller machines (ATM) all around Bonifacio Global City, so many that in fact, you will never need to worry about going more than a block before having access to one. There are also plenty more other banks with their own ATMs along avenues and streets of Bonifacio Global City. Many of these ATMs have a guard or two hanging about the vicinity so it’s perfectly safe to make cash withdrawal even late at night. Some ATMs also accept bills payment, this could be a useful timesaver if your amenities accept ATM payments! There are five major ‘food districts’ at Bonifacio Global City, each one having their own signature restaurants and other dining establishments for whatever you may fancy. More restaurants are now starting to be virtually found anywhere in The Fort, especially in the already developed area between 1st and 3rd Avenue, where is not unusual to find affordable and expensive restaurants being next to each other. Just take a look at the menu usually posted outside to have a glimpse of what to expect in terms of price and services. Of course, fast food places are also plentiful around the area, for those who wish to grab a bite while on the go. Many restaurants will also offer delivery services. Bonifacio Global City prides itself as ‘the home of passionate minds’. It is therefore fitting that several of the most prestigious private schools in Manila are also located here, giving quality and international-level education to young, passionate minds.